Camila Cabello made Grammy Awards history on Feb. 10 with her performance of "Havana." She became the first Latina artist to open music's most coveted award show. Cabello was invited to this year's Grammy Awards thanks to her two nominations: one for Best Pop Vocal Album for Camila and the other for Best Pop Solo Performance for "Havana." 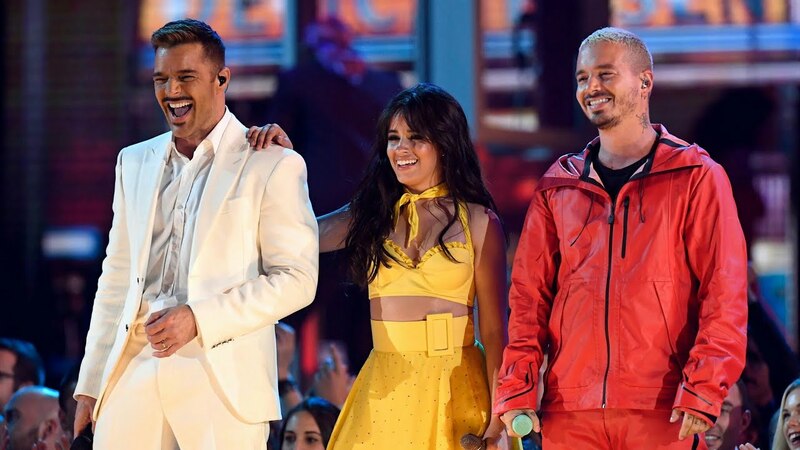 Even though Camila did not win either, she made still made history on Sunday night in a special medley that celebrated Latinx culture and Latin music's breakthrough. In a scene set up like a solar habanero from her grandmother's days in Cuba, or a "house in which every family live in a room," she strutted through while singing her solo smash hit "Havana" with featured rapper Young Thug. Cabello's family, her father and sister Sofia, also made a cameo appearance, playing people in a room below who wanted the "racket" turned down. Another fellow Cuban-American artist, legendary trumpeter Arturo Sandoval, appeared afterword with his signature instrument and brought more authenticity to old Havana-like scene. Puerto Rican superstar Ricky Martin suavely followed with a rousing rendition of his 2006 single "Pégate," which got the house moving. He's a pioneer in Latin music for his groundbreaking performance of "La Copa de la Vida" at the awards ceremony 20 years earlier. Colombian reggaetonero J Balvin, who was nominated for Record of the Year for "I Like It" with Cardi B and Bad Bunny, rounded out the medley. He put down the newspaper with a "Build Bridges Not Walls" headline and kept the party going with his global smash "Mi Gente." The Latinx artists came through with lots of color, camaraderie and representation. Cabello and J Balvin didn't win their awards, but they put Latin music into the spotlight on music's biggest night. Hip-hop star Cardi B, who has Dominican roots, is another Latina that made history. She became the first female solo artist to win Best Rap Album for Invasion of Privacy. The Latinx-cellence was real at this year's Grammy Awards.